Time flies! Today was already the last day of our Study Trip. When we met in the morning, some seemed a bit tired, others very excited for this interesting final day. 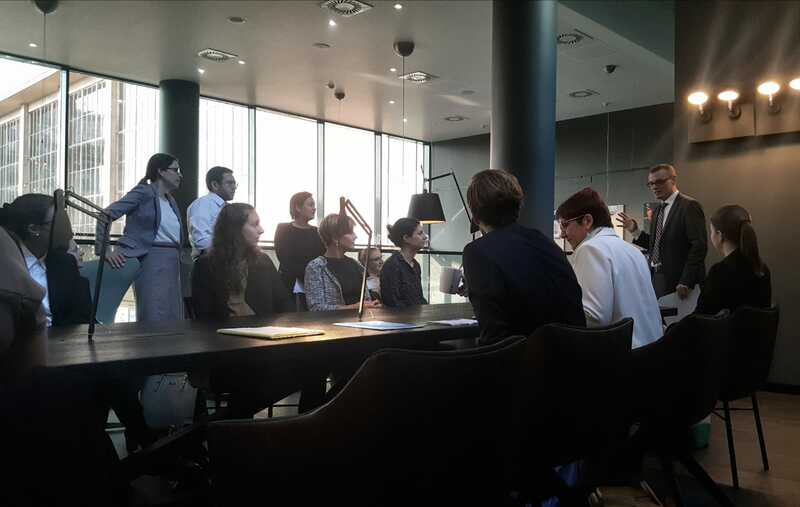 We started the day like always with a presentation of the program and a short introduction of the topic at Motel One. Since the best always comes last, today was the day we visited the Federal Ministry of Digital and Economic Affairs (BMDW). The ministry only exists in its current form since the first of January 2018. Therefore, we felt truly honored to be some of the first students to visit this ministry. Until 2018 the BMDW was part of the ministry of Science Research and Economy. After the reorganization, the goal of the BMDS is to enhance the development of Austria as a business location and boost opportunities for digitalisation. This is a very important task as ICT is the main economic driver of Vienna! The current Minister of the BMDW is Dr. Margarete Schramböck who studied Business Administration at the University of Economics and Business in Vienna. Subsequently to her studies she held numerous positions in the private industry and was also CEO of A1 Telekom Austria. After the program presentation we immediately made our way to the ministry in great anticipation. As a result, we were a bit too early and used the time to take some pictures with the stunning scenery of Vienna. At the ministry we were then warmly welcomed by Mag. Daniel Medimorec and escorted to the third floor where Dr. Bernhard Karning awaited us. 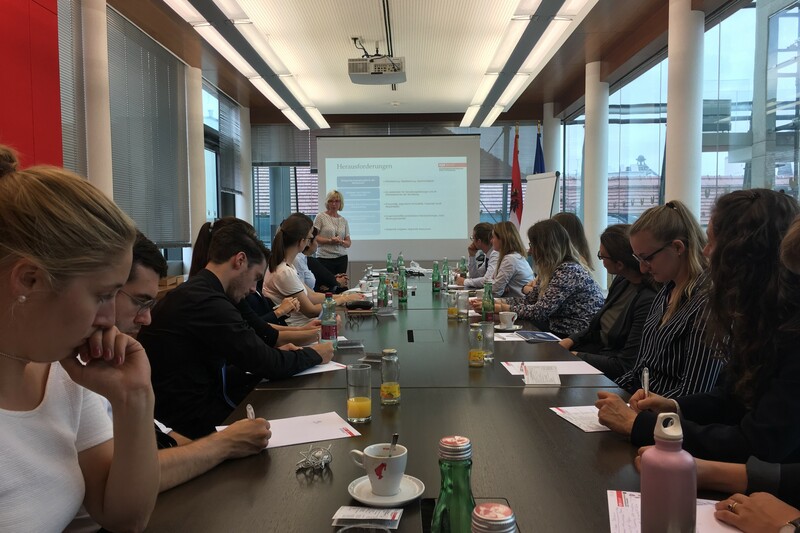 After we already learned about the digitalisation strategy of Vienna in general yesterday, today was all about the very specific topic of electronic identities. Contrary to Switzerland, Austria has already implemented an electronic identification system more than a decade ago. Since then the system has continuously been updated, remodified and improved. What started in 2004 with an electronic identification number embedded in the insurance card is a holistic electronic service for the citizens of Austria by now. But what is e-ID all about and how does it simplify the daily life of Austrians? In a nutshell; the e-ID is an electronic citizen’s card based on a personal identification number. This card allows Austrians to deal with the authorities in a fast, uncomplicated and convenient way. The citizen simply logs into the system using his mobile phone number and password, he/she is then able to request a new parking card or to file a motion. Therefore, Austrians are no longer dependent on the opening hours of their authorities. Furthermore, the e-ID can also be used to sign or cancel contracts and replaces the classic signature. Today, more than 1 million Austrians are already using the system and the number of users is increasing day by day. Recently the BMDW has introduced a new feature which allows to log in the system using a fingerprint instead of a password, this shows that the BMDW is not resting on its laurels. Furthermore, data protection and security are major concerns for the BMDW, consequently every e-ID is linked to different numbers for each ministry. This system ensures the highest levels of data protection. 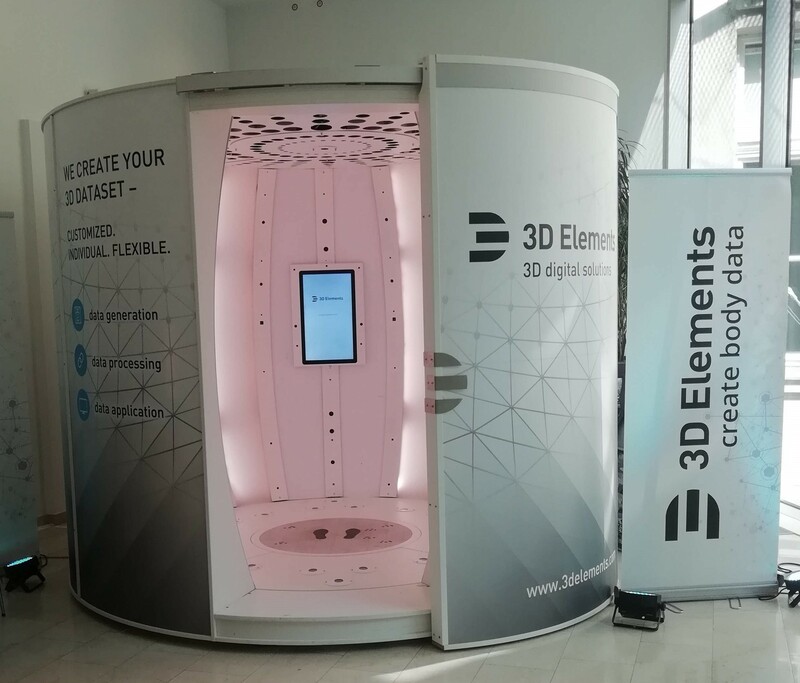 After the presentation, we were invited to visit the “3D photo studio DAGUBERT” which is currently exhibited at the BMDW. DAGUBERT is the first fully automated, mobile 3D studio. It collects 3D data on a one-millimeter accuracy level. Soon, this system can be used for electronic fitting rooms or ordering custom made clothes. With this, the official part of our study trip to Vienna ends. On behalf of the whole class, we want to thank Dr. Brunner, Dr. Fuchs, Dr. Brüesch, Dr. Mertes, Mr. Horni and everybody else involved in the organisation of this amazing trip. 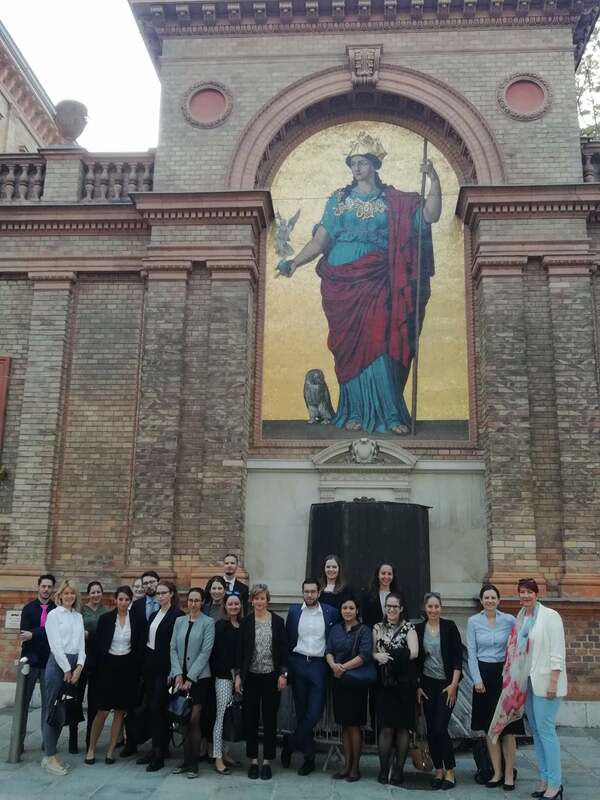 We learned a lot and gained insight into ministry activities of Vienna, which we would never have been able otherwise. We return to Switzerland inspired and motivated for our next semester. And with a last goodbye coffee we leave this vibrant, buzzing and modern City. Thank you Vienna for your modernity, for your value of history and your amazing citizens! Today is the beginning of the second part of our study trip which is dedicated to one of the most widely-discussed topics nowadays, namely the DIGITALISATION. Yesterday Pr. Dr. Caroline Brüesch and Dr. Alexander Mertes joined us in Vienna and will accompany us during the rest of our trip. Probably no other town in Europe can offer you a more comprehensive insight into this topic as the city of Vienna (and if you have doubts about it, just continue reading and they will surely be dispelled before this text ends). 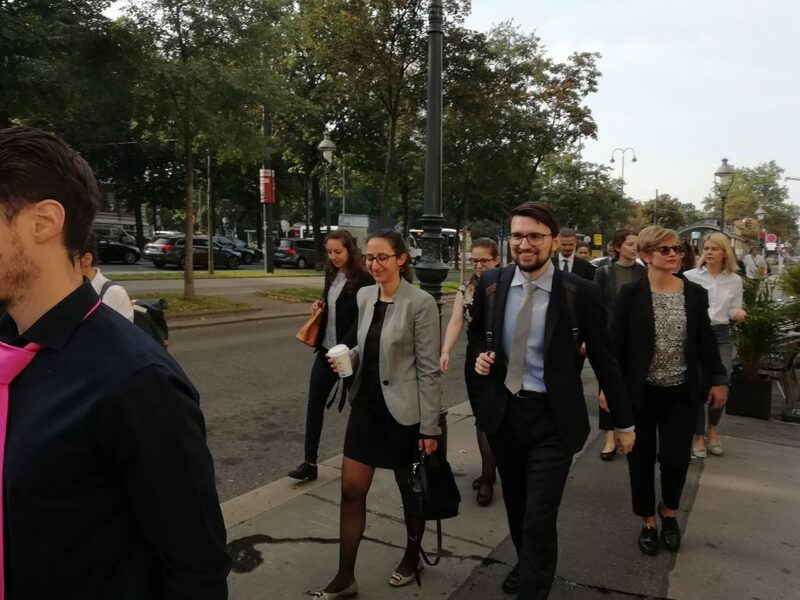 After a usual kick-off briefing at the Motel One we hit the road to the Chief Executive Office of the city of Vienna. It was represented by Thomas Schuhböck who is part of the Executive Group for Organisation, Safety and Security and is responsible for process management and ICT strategy. Then Mr Schuhböck turned back to the actual digital agenda. On average, the people in Vienna are quite well advanced in using the Internet (utilization of the Internet comprises 86%) and they prefer surfing on their mobile devices and not on PCs (the municipality labeled it as the “mobile first” trend). Mr Schuhböck also drew our attention to the fact that the ICT’s added value in Vienna is threefold higher than the added value of tourism. Also, the city of Vienna is supporting “digital salons” aimed at promoting IT themes among women. Subsequently Mr Schuhböck moved to the Smart City Wien principles: While the main components of the Smart City concept are quality of living, resources and innovation, social inclusion is crucial. The same emphasis on the citizen’s participation was manifested in Vienna’s digital strategy. 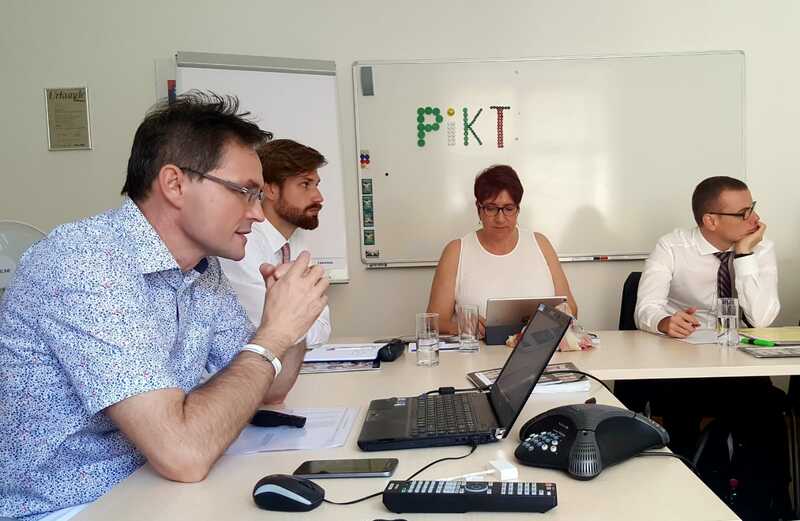 According to Mr Schuhböck, it is the first digital strategy that was developed together with citizens. In a first step, an Internet based participation platform was created in 2014 in order to involve citizens in the idea generation process. In a second step, the conceptualized ideas were presented to the public for discussion. Because as Schuhböck put it, “an informed citizen is a satisfied citizen”. The finalized strategy was published in June 2015. To demonstrate the concrete output of Vienna’s digital strategy, Mr Schuhböck highlighted a couple of “lighthouse” projects. 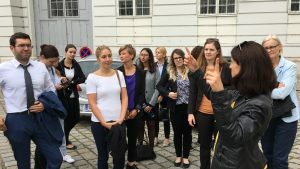 For example, “Sag’s Wien” (or for anglophiles “Tell it Vienna”) was established to report defects which Vienna people spot on the street; DigitalDays2018 was created as a coordination platform for Vienna’s citizen-oriented participatory activities. And the concluding message and a personal “lesson learned” from Mr Schuhböck: Don’t be afraid to launch a project even when it’s just 80% ready. People will be there to help you fix it. Does E-Voting Have a Future in Austria? The focus of our afternoon programme was the future of e-voting in Austria. We went to an outpost of the Federal Ministry of Interior where we were welcomed by a very enthusiastic Mag. Robert Stein, head of the Department III/6 for Electoral Affairs, and Renate Strohmaier, Senior Specialist for Electoral Affairs. With his witty comments Mr Stein instantly managed to raise our interest in the topic. 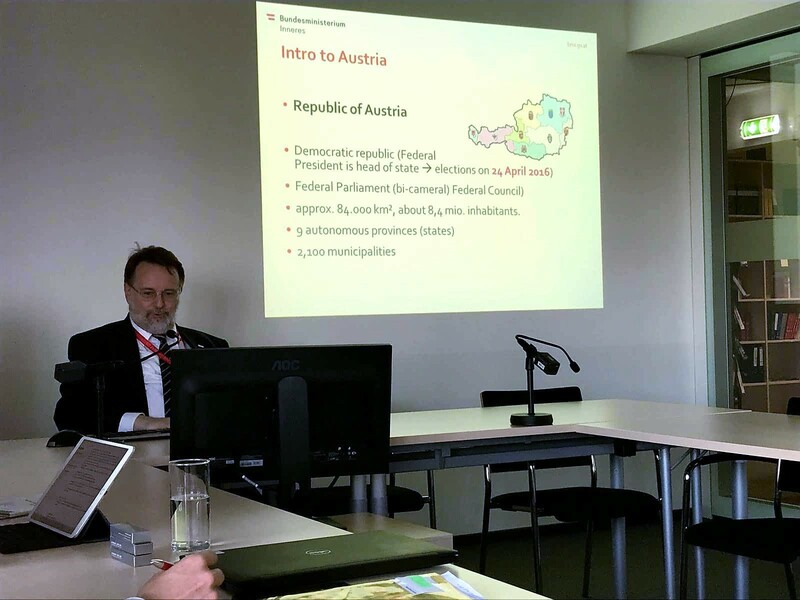 After a brief intro to Austria’s federal system, he dwelled into the specific features of Austrian electoral processes. He explained that the principles of Austria’s electoral legislation are stipulated in the federal constitution and therefore must be applied in every federal state and municipality. One of those principles states that a citizen must cast her/his vote in the presence of an authority representative or per post (postal vote was introduced in 2007). This means that in order to introduce any e-voting system, the Austrian constitution would need to be amended, which would require a two-third majority in the Parliament. 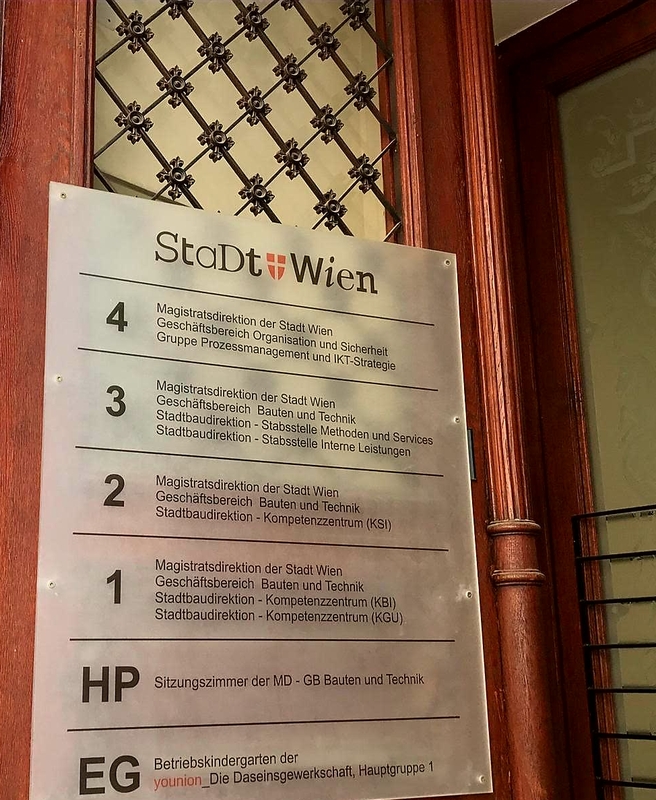 Since this majority hasn’t been secured yet due to controversial and sometimes opposing views of Austrian decision-makers, there is no legal basis for e-voting in national and local political elections, Mr Stein concluded. He mentioned the Austrian Students’ Elections (2007) as a pilot project to test how an e-voting system could be implemented. The Constitutional Court ruled in 2011 that the legislative implementation of e-voting was in compliance with the constitution, but high standards must be fulfilled. Regarding the outlook for e-voting in Austria, Mr Stein argued that the introduction of an e-voting system should still be possible in principle. Should the law-makers now decide to introduce it, one requirement would already be satisfied as an Electoral Register was established in Austria in 2016. However, e-voting still faces fundamental challenges. For example, there are still concerns over the issues of one-to-one identification and data protection. Rise and Shine – this morning we were finally greeted with some splendid sunshine. Hence, the group met at Motel One infused with a lot of energy for the day to come and a cup of coffee in hand. During the morning briefing Daria and Ana informed the class about our program of the day and the organization we were about to visit: The World Bank. They are in charge of developmental work and hence not a bank in the classical sense. Further information was provided about the history, location, and multinational development of the World Bank and most importantly the specifics of the Center for Financial Reporting Reform (CFRR), which is located here in Vienna. We were told some specifics about the representative we were about to meet: Dr. Andrei Busuioc, a Senior Financial Management Specialist for the CFRR. 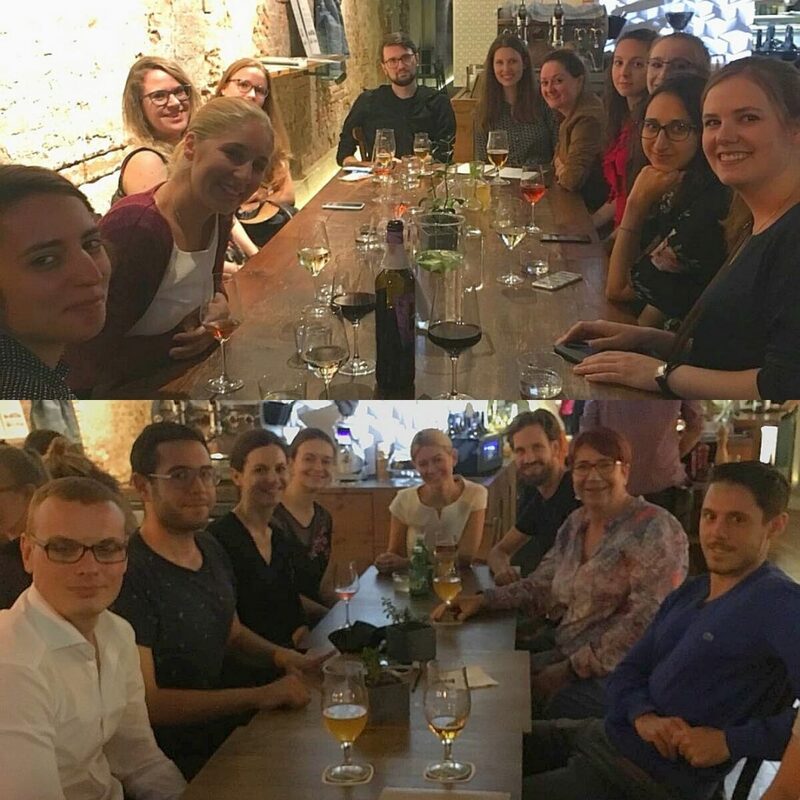 After Sandro Fuchs summarized the big picture and especially highlighted the differences between the International Monetary Fund (IMF) and the World Bank, Karin Brunner said her goodbyes and we sent her off to London to meet with our classmates from the health specialization. After a quick ride on the Metro we enjoyed the sunshine during a more or less anticipated 10-minute walk to our destination. Upon arrival at a super modern glass building a high-speed lift brought us up to the 19th floor where we were greeted with a spectacular view from the offices of the CFRR. Ending poverty, building shared prosperity. His presentation left us with the impression that the World Bank is a people-oriented organization which builds their capacity on cultural diversity, knowledge transfer and long-term experience of their employees. They furthermore pride themselves as being highly transparent through making every document publically available. After around an hour Goran unfortunately had to leave for his next appointment, although we had the impression he would have loved to answer more questions from our class. 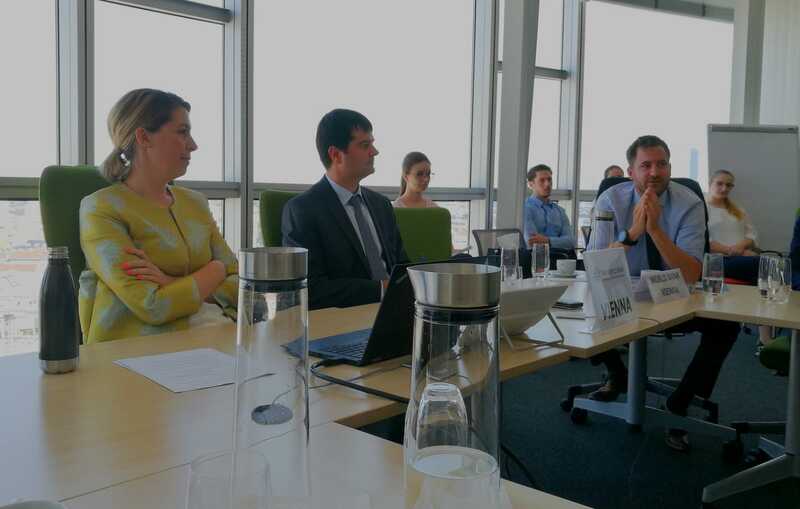 Following, Andrei presented an overview of the CFRR, with their main goal of capacity building in auditing and improving financial reporting infrastructure. Specifically, we discussed projects in several European and Central Asian countries, many of which received partial funding from Switzerland. Antonia took over as the last presenter and elaborated on the anticipated implementation of accrual accounting standards. One of the main challenges the World Bank faces in this regard is that countries often underestimate the time it takes to change their public financial reporting system. Interesting enough, implementing accrual accounting alone does not fulfil its purpose if countries and people do not have the capacity to actively use the system. To finalize her presentation Antonia treated us with a nice video on a current program (PULSAR) in partnership with the SECO, in which Sandro Fuchs held a starring role. Not only for us, but it also takes the World Bank and its employees a lot of energy, endurance and passion to initiate and accomplish their projects and goals. Just kidding! We met up with the whole class at Garage 01 for one, two, three… drinks and some delicious food. As today’s program started a little bit earlier than yesterday, there were still some tired faces when we met at 8 o’clock in the lobby of Motel One. After a short briefing about the program of today, which included some general facts about the Austrian Court of Audit (Rechnungshof), mentioned as a secret highlight of the week by Pascal Horni, and the Austrian Federal Ministry of Education, Science and Research, as well as information about the speakers, we made our way to our first stop by public transport. The Austrian Court of Audit is located at Dampfschiffstrasse 2 in the financial district of Vienna. On our way we passed the Austrian Federal Computing Center, about which we already received some information yesterday. After a warm welcome from Mag. Sandra Fuchs and Mag. 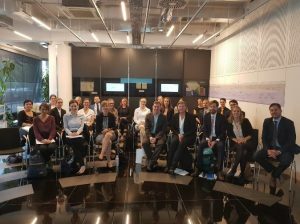 Bernhardt Schatz, we were introduced to the main tasks of the Austrian Court of Audits. Mag. Sandra Fuchs is a member of the General Secretariat of INTOSAI, the International Organisation of Supreme Audit Institutions. She is responsible for regional organisations and member services, as well as bilateral and multilateral contacts. The Austrian Court of Audit was founded in 1761 by Empress Maria Theresia as a control body with the rank of a ministry. 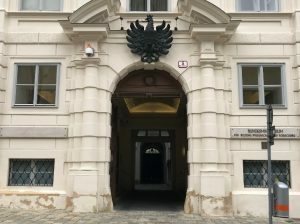 Within the framework of its constitutional independence, the Austrian Court of Auditors controls whether the public funds are used economically and functional. The exercise of public control is one of the cornerstones of parliamentarism and democracy. Consequently, independence of the Austrian Court of Audit is a big and very important factor. Unlike other ministries, with a normal term of office of 5 years, the independence of the ministry is guaranteed with a term of office of 12 years. The two main tasks of the ministry are; performance auditing and consultancy. 75% of the consultancy recommendations are being implemented. The other 25% often receive creative solutions and a period of 5 years for possible implementation. We were also introduced to the INTOSAI, which is an autonomous, independent and non-political organisation and operates as an umbrella organisation for the external government audit community. INTOSAI’s headquarter has been located in Vienna since 1968. It has 194 member states and Switzerland was one of the co-founders in 1953. Digitalisation is a major issue and regarded as a big opportunity. 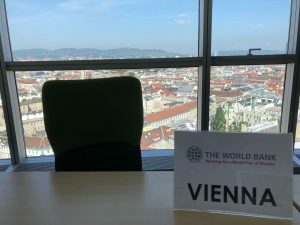 However, it is difficult and a rather slow process to implement such measures in the Austrian Court of Auditors, whereas at INTOSAI 30 people are already developing an app through a hackathon. After the presentation of Mag. Sandra Fuchs, Mag. Bernhardt Schatz introduced us to the Audit of the Austrian federal accounts. He presented some facts and figures, as well as the main tasks and the timeline of the annual report. We were happy to hear that Switzerland acted as a role model for the components of the federal accounts. One of the challenges is, that the budget regulations influence the budget allocation practice. This raises the question whether the independence of the ACA is guaranteed at all times. 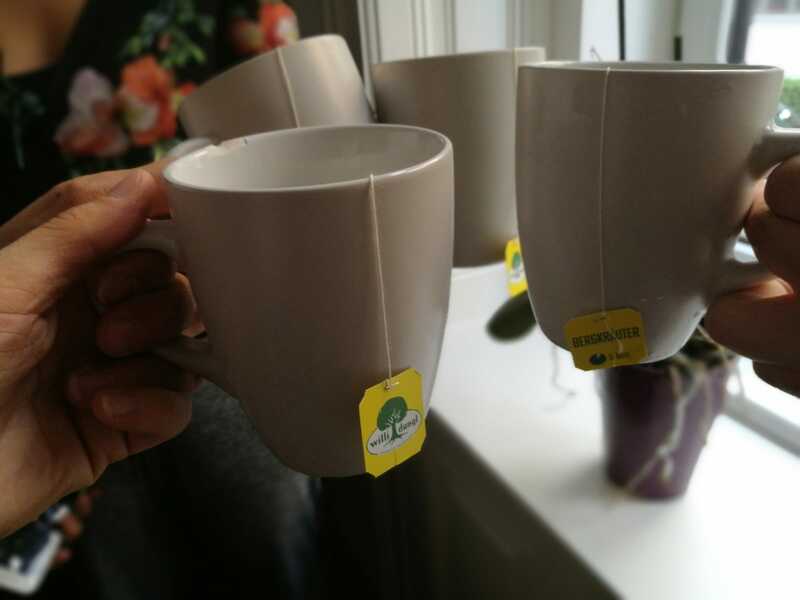 Finally, we had the pleasure to enjoy a nice cup of coffee or tea and some refreshing drinks while we still had the opportunity to ask questions and continue our discussion. 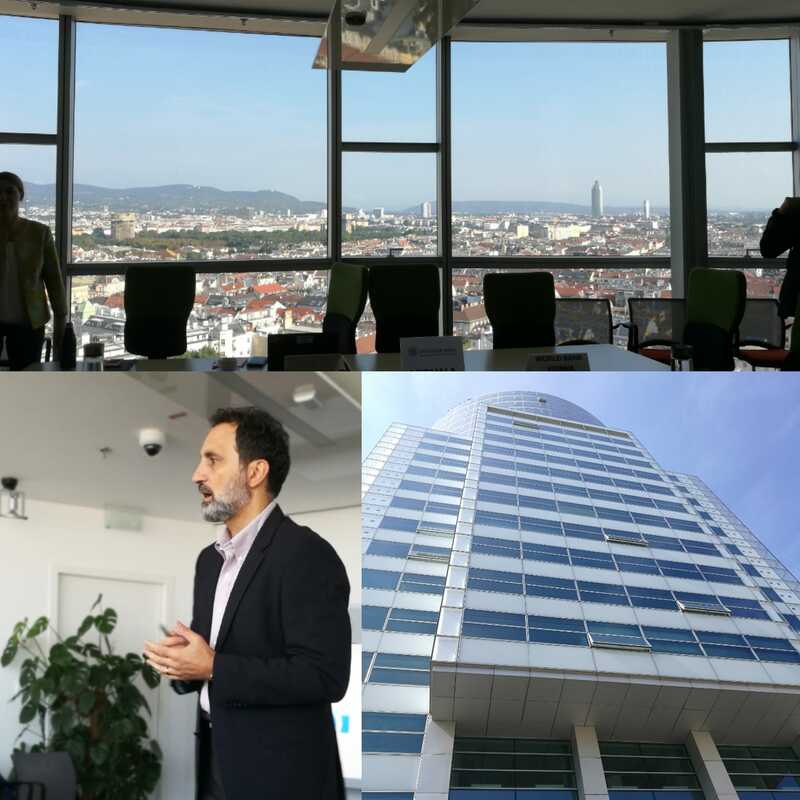 After an individual lunch we directly met at the Austrian Federal Ministry of Education, Science and Research (BMBWF), located in the middle architecturally stunning city centre of Vienna. The building of the ministry once belonged to the dynasty of Count Starhemberg and is mostly in its original state and was redecorated accordingly after the Congress of Vienna. Mag. 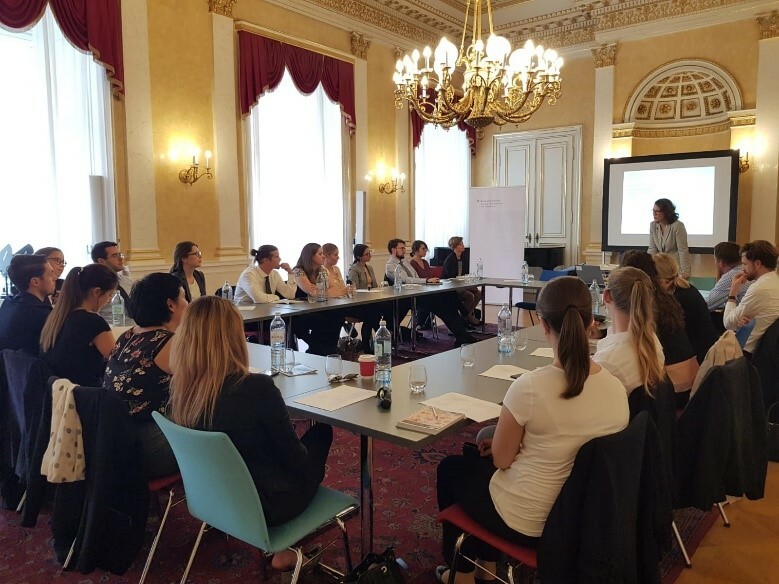 Dr. Iris Rauskala, head of the section, warmly welcomed us to the baroque style conference room for a 2-hour presentation and discussion. The Ministry’s responsibilities in the area of education cover the entire school system including primary school, secondary school, university colleges of teacher education, adult education and lifelong learning. Since last year, the ministry has changed significantly. Since the formation of the new government, the Ministry has been divided into five sections, whereby the 4th and 5th sections deal on the one hand with universities and universities of applied sciences and on the other hand with scientific research and international affairs. In total, the Ministry has a federal budget of EUR 78 billion for 2018, of which EUR 8 billion can be allocated to education and almost EUR 5 billion to science and research. The Austrian higher education area offers space for a total of 384’548 students with the majority of students (309’172) studying at the 22 public universities. Despite the Austrian federal system, these universities are regulated centrally by the Federal Ministry of Education, Science and Research, with the universities of applied sciences being controlled by municipalities or private sponsors. In comparison to Switzerland, which is also a federal country, this distribution of tasks is a characteristic difference. Austrian universities are characterised by a rather low degree of mobility, with the majority of almost 58’000 students coming from Europe (90.8%), especially Germany and Italy. In a European comparison, Austrian universities have a broad status of autonomy. 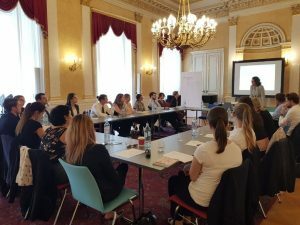 The education sector is expanding continuously and the number of students is increasing, which is also reflected in an increasing overall budget. However, the number of students is increasing even more and is coupled with further challenges. For example, the study access is rather uncoordinated, there are many inactive but enrolled students, which results in an often long duration of study and high dropout rates. The ministry has defined a total of five impact goals in order to systematically tackle the problems. Mag. Dr. Iris Rauskala was quite critical regarding the impact goals, as they are not measurable, without a timeline and one goal includes different areas. When developing measures, however, it should always be ensured that the public interest is taken care of and the system is being improved. According to the head of the section, Mag. Dr. Iris Rauskala, education as a public good is very important for Austrias society and should/will probably remain so in the future. Our first day in Vienna started in the beautiful „Palmenhaus“ next to the „Schmetterlinghaus“ in the centre of the city. After a warm welcome from our lecturers along with coffee, tea and croissants, we were briefed about our upcoming day. At the memorial against war and fascism in front of the „Wiener Staatsoper“, we met our tourguide Yvonne Heuberger-Dornauer, who briefly introduced us to the history of Austria and particular Vienna. Our first stop was in front of the national library on the place named after Josef II, who is immortalized as a statue. In contrary to his relatives, he went down in history for being an enlighter, who passed many radical reforms. His mother, empress Maria Theresia, perfected the Habsburger marriage policy, by engaging her twelve children with all the important dynasties and acomplished many useful alliances for the Habsburger. After a quick walk through the „Schweizer-Hof“, which was named after a battalion of the Swiss Guards, who were stationed there in the 18th century, we stopped on the „Heldenplatz“. After an individual lunch, we met at the Federal Ministery of Finance. Chief of staff, Mrs. Daphne Aiglsberger, welcomed us in a conference room in the 4th floor of the former winter residence of Prince Eugene of Savoyen. Firstly, she gave us an overview on the ministery. In contrast to Switzerland, in Austria the fiscal sovereignty and tax Collection is entirely in the hands of the federation. She introduced us to the recent developements in digitalisation and New Public Management reforms on finance matters. We talked about the challenges of the departement of finance administration, management and services. For example the growing complexity of economy through globalization and digitalization. She talked on how they intend to improve the usability of the tax declaration and customer service as a whole. The question how to cope with the latest developments and how to engage engage in cutting-edge technology such as blockchain and the concept of big data is still open to some extent. In the end, we had time to ask some questions. We noticed that the people of Austria prefer customer-service over absolute data sovereignty in contrast to Swiss people. Centralization of tax sovereignty in Austria also helps to take further steps in digitalization, such as online tax declaration, chatbots or apps for small enterpreneurs. At 4.30 p.m. an interesting presentation and thus our daily program ended. As part of their unique curriculum, the MSc BA Students with the Specialization in Public and Nonprofit Management embark on a study trip to Vienna to learn about Austria’s government institutions and to dive into its administrative context. In particular, allocating, administering and making effective and efficient use of taxpayer’s money are topics, which will be covered during the visits at the Austrian Ministry of Finance, the Austrian Court of Audit or the Ministry of Science and Education as a budget executing entity. 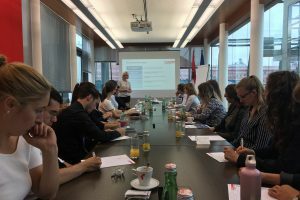 A second focus of the study trip is on digital transformation of public administration, which will be touched by visits of the City of Vienna, which has launched its “Digital Agenda”, or the newly established Ministry for Digital and Economic Affairs. An exciting and insightful week is awaiting the students, who will take over this blog and share their experiences.